The movie Spider-Man has raised many questions about spiders and what all they can do. Some people think that there are some spiders that might have magical powers. Others might be scared of them because of the way that they look or they might be afraid of the spider biting them. There are a few spiders that are indeed poisonous while others happen to be very harmless. Another thing about spiders is that their size varies and you might see some very tiny ones and other spiders could be huge. Spiders also make a variety of webs but so far research shows that there is not a relationship that is consistent with the spider webs. Here’s a list of the top ten weird spiders. 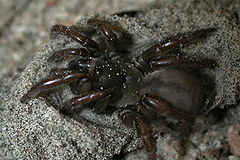 A wafer trapdoor spider belongs to the super family of Cyrtauchenioidea and to the family of Cyrtaucheniidae. These spiders tend to be widespread but they don’t have thorn spines on them such as the metatarsi or tarsi spiders. Most of the wafer trapdoor spiders like to make doors to the burrows that they make. 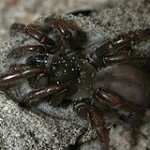 Other trapdoor spiders might make doors that appear like a cork. This type of spider can be found in the USA, Mexico, Africa and South America. A grand daddy long leg is also sometimes referred to as just simply Daddy Long Legs. What makes this spider stand out is the legs because they are very long and they have 8 legs. It got its name from the legs because of how long they are and because of how many the spider has. It also only has two eyes and other species have around six up to eight eyes. In order to kill its prey it injects venom on it and kills it. The Crab Spider is actually one spider that looks oddly unique. It is one spider that is very eye catching but you might not ever see it because this spider can easily blend in to its surroundings. One thing that is very unique about this spider is that it does not make a web but instead it waits inside the flowers and catches prey in the flowers. They have been known to change their color so that way they can match the leaf or either the flower they are sitting on. The second pair of their legs is also longer than the rest of them. Their colors tend to be yellow, orange, green, grey and white. They are called the Crab Spider because of how they resemble crabs. A purse web spider is very shiny and black. They are medium sized. Like a lot of spiders they have 8 legs. The Purse Web Spider also does not weave a web. Instead what they do is they knit tights plus upright tubes that are silken. Their diet is insects or either other spiders that might be smaller than them. The Purse Web Spider is known to bite plus they can be dangerous if you are sensitive to spider bites. Another name for the Purse Web Spider is the Atypical Tarantulas. 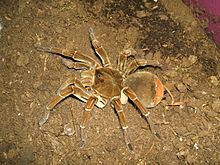 ’s called the Goliath birdeater is because back in the Victorian era there was one eye witness that saw the spider eating the hummingbird and they named the spider accordingly. This spider belongs to the family known as the Tarantula family. They are mainly found in the South American forest. The leg span of this spider goes up to around 12 inches. They don’t make a web either. When a bird is not around they might eat crickets, mealworms and mice. If they come in contact with a human they might cause the human to have an irritation that is severe. The Wasp Spider is also known as the Argiope Bruennichi. It is part of the orb web spiders and it’s distributed mainly throughout parts of central Europe, North Africa, Some of Asia and Northern Europe. On the abdomen it has markings of yellow plus black striking. This spider has a very fascinating way of catching prey. It wraps up their prey in silk and then it bites it and injects venom that is paralyzing plus it has an enzyme that has protein and it dissolves. The female species of this spider is bigger than the male. The Mopsus Mormon Australia’s Green Jumping Spider comes from the family known as the Salticidae. The Mopsus Mormon females happen to be 12mm with length. These spiders can be found in places such as Western Australia, New South Wales and in New Guinea. The males have sharp plus very bright colors and their whiskers are white and rather attractive looking plus long. The whiskers are also white. However, the females do not have the whiskers plus they also do not have the topknot. Instead, the females have a mask that is white and red that looks elegant. People might not look at spiders as an artist but some of them seem to b because of how they make their home. The Writing Spider has skills plus almost appears to be artistic when it comes to building their home. The abdomen is colored. The reason why they are called the writing spider is because of the way they make their webs. All of the webs that they do you will find in the patterns of both Zs plus Xs and it goes down in the center part. These spiders do bite, however they bite is not considered dangerous. The eggs from the female can contain around 400 up to 1400 or more eggs in their web. The Huntsman Spider is also known as Heteropoda Venatoria. The Huntsman Spider is also known as the giant crab spider. This kind of spiders stays in places that are warm such as some of the southern states in the USA, Africa, the Mediterranean, Australasia and Asia. It comes from the family of the Sparassidae spiders. These kinds of spiders have 8 legs. Most Sparassidae spiders such as the Huntsman Spider uses venom in order to immobilize their prey then digest it. The can bite humans but not considered as dangerous. The Arrowhead Spider is very unique and the colors of this particular spider also make it look beautiful. This kind of spider lives in the forest. The abdomen of the Arrowhead spider is yellow and the head is red. The pattern of the abdomen is also attractive. This spider has horns that are defensive. It is known to be around in the seasons of spring, summer and in fall. The good news about this odd and beautiful spider is that it will not harm a human but it does have an appearance that looks like a flower and that helps it with tricking insects and pollinators.